What began as one man’s story three decades ago is now everybody’s music. 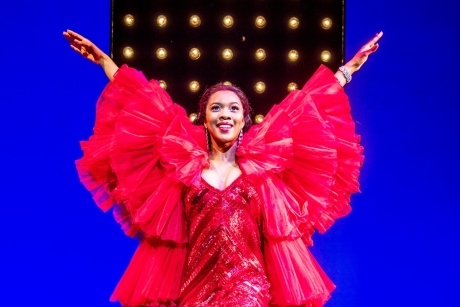 Keeley Rodgers reviews Motown the Musical at Shaftesbury Theatre to find out if it’s still one of the hottest shows in town. You know you’re in for something special when there’s a sign warning theatregoers not to get ‘over enthusiastic’ in their seats during the performance. Having been brought up on Motown music, with the likes of Marvin Gaye, Stevie Wonder and Diana Ross, on repeat, I knew it would be a night to remember. The show begins in 1983 and the eve of the Motown Records’ 25th anniversary celebration. Its creator Berry Gordy who made his childhood dream a reality, takes the audience on a journey down memory lane as he looks back on his spectacular career. What follows is two and a half hours of musical happiness. With almost 50 classic hits from My Girl and I Heard It Through the Grapevine to Ain’t No Mountain High Enough and Reet Petite, there’s no escaping the infectious rhythm and beat. Pictured: Jay Perry (Berry Gordy). (Photo credit: Tristram Kenton). Think bursts of colour, sequins, perfectly coiffured wigs (there’s a long list of wig-related staff in the credits) and a wardrobe of glitz and glamour. The stage is simple yet stunning, allowing the music and performances to explode and fill every space with pizazz and effortless energy. No matter what age, everyone is familiar with the sound of Motown; its success is brought to life through performances by so many stars, the Temptations, Four Tops, the Supremes, Smokey Robinson, to name a few. What’s less known is the story of Berry Gordy, the man with his own dream who created the sound that changed America. He’s very powerfully portrayed by Jay Perry, who puts his all into each performance, whether it’s his determination to succeed, or the very tender moments in which his relationship with a young Diana develops. 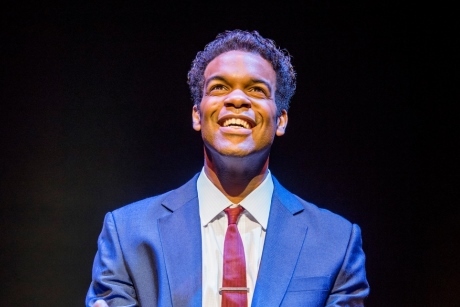 The musical charts the rise of Motown against the backdrop of the US civil rights movement; moments of joy are interrupted by pivotal historical events such as the assassination of JF Kennedy and Martin Luther King, just as they would have been then. Pictured: Natalie Kassanga (Diana Ross). (Photo credit: Tristram Kenton). You can often pick out a handful of stand-out performances in a show. With Motown, under the direction of Charles Randolph-Wright, it’s impossible. The whole ensemble ooze talent, charisma and belt out flawless and powerful numbers, over and over, as well as displaying the most stunning choreography, directed by Patricia Wilcox and Warren Adams. But I can’t pass up mentioning just some of the outstanding cast, especially the new additions. Natalie Kassanga as Diana Ross is every inch the glamorous superstar from performing with the ground-breaking trio the Supremes, to her rise to fame as a solo artist. Carl Spencer as Marvin Gaye, embodies the powerful message behind Motown while David Albury continues to portray the legend that is Smokey Robinson and Mitchell Zhangazha as the unforgettable Stevie Wonder. I haven’t even started on the pint-sized, young versions of Michael Jackson, Stevie Wonder and Berry Gordon; the roles are shared by the mini superstars Cruz Lee-Ojo and Tumo Reetsang. There is so much exceptional talent on one stage – if you don’t have your Motown mojo going in, it’s impossible to leave without it. You’ll be dancing in the aisles, and then the streets going home. They say Motown is an institution. It’s fair to say, I’m well and truly institutionalised, and all the better for it. (Lead photo credit: Tristram Kenton).